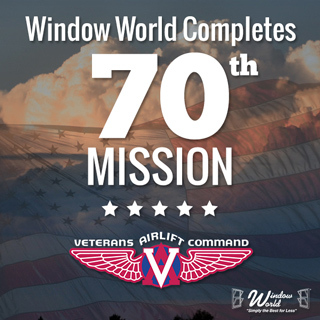 WASHINGTON, D.C. — Window World®, America’s largest replacement window and home remodeling company, completed its 70th Veterans Airlift Command (VAC) mission Tuesday, September 30, 2014. Following their participation in this past Saturday’s Capital Region Tough Mudder 2014 in Gerrardstown, WV, Window World flew 7th Special Forces Group MSG Jared “Red” Bullock, Army Ranger PFC Kyle Emmons and MSG Troy Konvicka home to San Antonio, Texas. Window World®, headquartered in North Wilkesboro, N.C., is America’s largest replacement window and home remodeling company with more than 200 locally owned and operated offices nationwide. Founded in 1995, the company sells and installs windows, siding, doors and other exterior products. To date, Window World has sold over 10 million windows. For the second consecutive year, Window World ranked “Highest in Customer Satisfaction with Windows and Doors” by J.D. Power. Window World is an ENERGY STAR® partner and its window products have earned the Good Housekeeping Seal for seven consecutive years.